KUALA LUMPUR (Nov 12): The FBM KLCI extended losses as investors eyed Malaysian corporate earnings, while falling crude oil prices dragged oil and gas (O&G)-related shares lower. Reuters reported that crude oil continued to drop amid fears of a supply glut, with Brent shedding about 0.9% to $80.93 a barrel. U.S. crude fell 0.9% to $77.25. Banking stocks such as AMMB Holdings Bhd, Hong Leong Financial Group Bhd and Malayan Banking Bhd also dragged the KLCI lower. 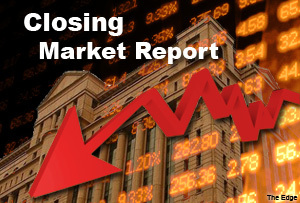 Yesterday, the KLCI fell 2.82 points to close at 1825.11. Today, Benny Lee, chief market strategist at Jupiter Securities, told TheEdge Markets.com that the KLCI lacked catalysts to push it higher. “Corporate earnings are not strong enough, so far,” Lee said over the telephone. He said recent weakness of ringgit against the US dollar had also exacerbated the KLCI's decline. The ringgit was traded at RM3.3355 against the greenback at the time of writing. Across Bursa Malaysia, a total of 1.7 billion shares worth RM1.8 billion were traded. Market gainers trailed decliners by 265 versus 510 while 322 counters were unchanged. Top gainers included Tenaga Nasional Bhd and IJM Corp Bhd while the leading decliner was Petronas Gas. The most active counter was Minetech Resources Bhd. Across Asia, Japan’s Nikkei 225 was up 0.43%, while South Korea’s Kospi rose 0.22%.